I’m primarily a network developer (online services) and spend almost all of my time in Linux, so decided I’d try and get it running, and it’s surprisingly easy! First step, we need to install PlayOnLinux and 7zip – PlayOnLinux is a wrapper around Wine, that picks the correct versions and extensions to make some games (and particularly Steam) run properly. 7zip is required to enable PlayOnLinux to extract some of the packages it requires. That should get PlayOnLinux itself installed. Fire it up, and you should be greeted with a welcome wizard – just continue through this until you get to the main PlayOnLinux screen. 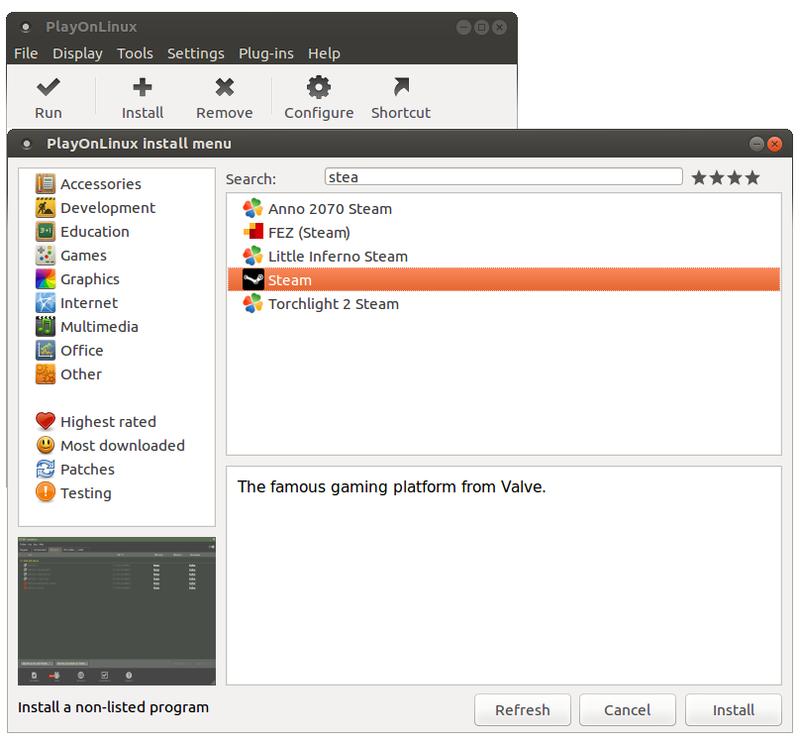 Click “Install”, search for Steam and choose Install again; this may prompt to install the Mono runtime and a few extras; the defaults should be ok.
Once installed, startup Steam! 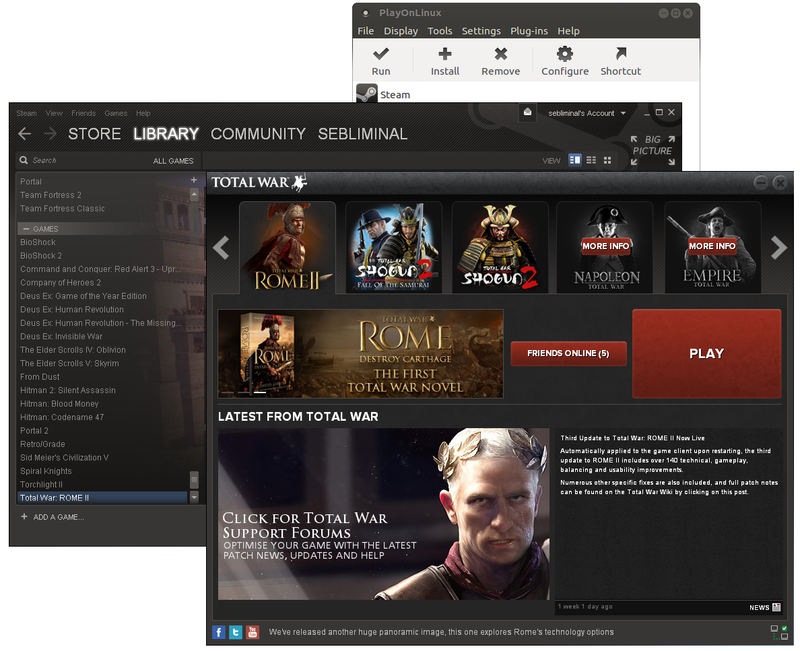 Obviously, you’ll need to actually own Rome II to do this… Select Total War: Rome II from your list of games, and click install (just as you would in Windows). Install Rome II and play! I just tried a multiplayer quick battle (with another real player) and all worked just fine; no desyncs or disconnects and in-game audio was all stellar. The framerate wasn’t quite as good as I’d hoped but I think with a bit of wine fiddling, this could be improved. I’d used PlayOnLinux to play the first Rome: Total War but I’ve encountered a problem while trying to run Rome II. It will load (albeit slowly) and you can start a Grand Campaign, but when you hit ‘end turn’ it freezes everytime. I’ve tried numerous versions of Wine and this is happening on the only version I can get to work (1.4.1). Do you have a suggestions as to what I could try? Also, I’d bought and downloaded Medieval Total War II (including the Kingdoms expansion) through steam. Neither of them will even start, on any Wine version I’ve tried. Do you have any suggestions with regard to it as well?